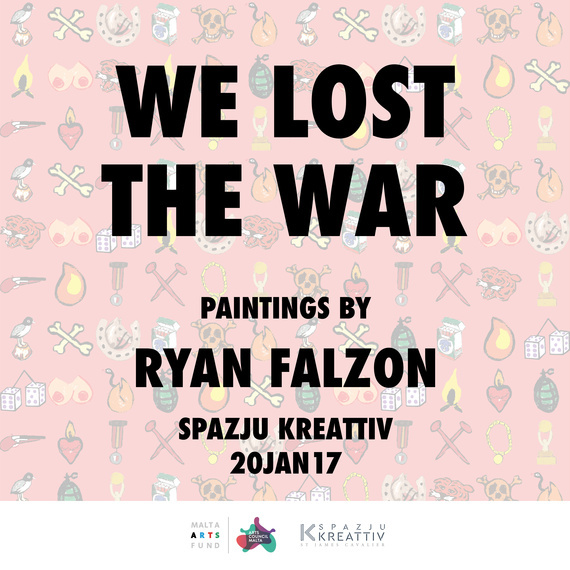 WE LOST THE WAR celebrates downfalls as much as victories, through layers of deceptive bright paint and pop iconology. The title refers to the idea of loss on a number of levels, of which two can be considered more important. The first is the violation and exploitation of the notion of a national identity. Isolation,technology and households in Western Society are the main themes explored in this project, with the intended final works clearly demonstrating the connection between individuals and their behavior within the confined environment of the home. Quirky habits, sexual fantasies and plain boredom are to be explored in the context of isolation found within the framework of a household in Western societies. The consumption of connections through social networks is proving to be as addictive and fulfilling as junk food, where the elements of cheap thrills and immediate fulfillment are the most sought. "Ex Voto" is a project that revolves around Christian iconography, the conditions of living on an island and the relation to the sea. Maltese seascapes are depicted in contrast with urban Berlin landscapes to create platforms on which solemnly silent figures exist. The works explore the ambiguous relation between the sea and the individuals who feel threatened by the physical isolation that it creates, but also feel that the sea gives them an identity, at par with their Catholic upbringing. This body of works bears testimony to contemporary salvation,liberation,and an introspective journey which often leads to solitude. One can also observe an investigation of activities, mostly nocturnal,that only a built habitat can support due to the nature of its infrastructure. The mechanical structures and high rise buildings silently survey everyday patterns of city inhabitants: over speeding,affairs, anonymous persons driving home after work. Disappointment,repressed sexuality and disillusion are present, creating a heavy,apocalyptic veil in the works. Fusing childhood memories, pop imagery and typical suburban environment, these works portray the suburban youth. There is an emphasis on the behavior of such youth, as they portray themselves the underdog from the movies, the oppressed but the cool ones.